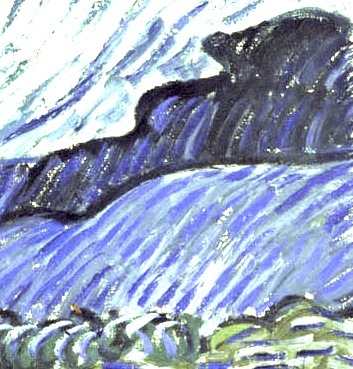 Vincent van Gogh has all the hallmarks of a traditional Lovecraftian protagonist. Brilliant and tortured, he perceived a world beyond the view of most men and brought it to life with his art. Like so many before him that vision would bring him to the edge of madness and beyond, eventually resulting in his voluntary commitment to the asylum at Saint-Rémy. While there he would paint his most famous creation- The Starry Night. Traditionally, the painting is a view of the northern night sky from his sanatorium window. Raven was kind enough to point out a quite different interpretation, based on a curious feature on the right edge of the painting. Enlarged and with a tweak to the contrast. The thought that one of the world's most well known paintings has a definite R'lyeh-ish aspect may be a bit outré. In that case, this serves as a good example of how a little creativity and a willingness to exploit pareidolia can inject the Mythos into almost anything. This is quite outstanding, and reminds me of how chaosium books would brilliantly re-interpret even ancient Chinese characters (an area of my study) to find Cthulhuesque elements. That is now all I will see whan I look at this painting, forever. I had an art history teacher to described these "rolling hills" as giant crashing waves. The cypress trees are a known symbol of death, and this interpretation made much more sense to me than the "oh look how pretty" version. And why couldn't they be some unknowable horror, anyway? It’s fun, but I don’t see it myself. Yes, you can use pareidola to project your expectations and desires onto a number of vague things and create a pattern or connectivity that is actually not there. The other example I can think of is the ley line thing where you can connect a number of random points to create a “connectivity”. Paleobabble is a great site with contributors who are actual archeology, linguistic, and scientific experts that puncture a lot of this pop culture pseudoscience. But in doing so, a prop maker can get some good points from their analysis of misapplied data. Basically, when you have an agenda and an undifferentiated blob of data, your need for theory validation tends to edit rather than scientific application. This is why the cornerstone of the scientific method is the ability to reproduce an experiment by dependent persons to create verifiability. However, pop pseudoscience can be a lot of fun and figures well into the Mythos. After all when you are dealing with colors and angles that don’t exist in this plane of existence, how can you apply Earthly science. It’s all Psychobabble To Me (ref Alan Parsons Project song). We here at the Arkham Sanitarium have a cure for all those problems: restraint and isolation. Clearly the image of Great Cthulhu has been digitally diminished. As has the police box. Sadly all I see is an Empire Srikes Back ion cannon. Didn't see Cthulhu no matter how hard I squinted, and I see that kind of stuff in a pile of dirty socks. But that post is darn good writing! And now I know what pareidolia is. P.S. : That night sky is impossible anyway. I am going to have to buy a print of this, so I can point out the "true" meaning of the painting to visitors. Oddly enough, Lovecraft was born August 20, 1890, not quite a month after van Gogh died July 29, 1890 — which, if you give any credence at all to reincarnation (as I don’t) could further some speculation. And also oddly enough, Lovecraft died on a March 15… van Gogh had been born on a (much earlier) March 30… curiously hinting at a grand circle through time….